Submit your consultant profile or service for consideration to DiversityCentral.com. You will be contacted by one of our editors after your submission is reviewed. The all new CDW Archive is now complete and searchable online! The entire collection of articles published in Cultural Diversity at Work, is now available online. 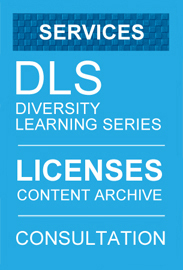 Loaded with best practices and innovative approaches, you can find articles on any topic concerning diversity. Search for articles on diversity measurement, organizational audits, organizational change, management development, accountability, awareness, intercultural communication.